THE QUESTION WHERE WE ARE FROM�.? The Question where we are from sometimes arose from our curiosity. For me, it is one of the biggest question in my life. Three years ago, I found two Netherlanders tried to answer this question. Although they are the Dutch, but they always miss to find their originality places. On the last weekend, I met them in Air Saga road when they were looking for public transportations. I said to our guests, our island didn�t provide public transportations. So, I rode my motorcycle with him to find the nearest ATM in Tanjungpandan City from their hotel. I saw him happy when I chose Tanjungpendam road. We could see beautiful beach near market. Calamoa island was located in front of this beach. I was surprise when my passengger stated Calamoa Island. I thought he knew this fact before they landed here from photos. At last, We were agree to meet again tomorrow on sunday. I have prepared new rental car for nice travelling tomorrow. But on that saturday, we have help them to fulfill their necessities by rental car in the mini market. We had a chance to travel around Tanjungpandan city and explained them about our city. They smiled when I showed small big Ben in downtown. There was an old watch made from Netherlanders in tin building. We called this building �Kantor Pusat Timah� or tin centre office. Nowadays, this old building was changed to be a BARATA supermarket. Another one was changed to be a BILITON HOTEL. On the next day in the morning, we traveled to Tanjungpendam again to watch Buang Jong festival. This is one of the traditional event in the shore to avoid natural disaster by providing a gift to the god of the sea. But remember, this is a traditional event by indigenous people that we called �suku Sawang� a long time ago in Belitung before Islamic entrance. A time to answer our question arose again. Mr. William asked me to look for his wife house, Mrs.Ellen, 55 years ago in Tanjungpendam area. We found an old house near Tin Harbour. Mrs. Ellen said this was look like her house or her father house in 1953 when her father was a lawyer there. Black boulder positioned in front of house. It has big space and settlers were Belitung family who guide this tin company house. We had a chance to observe broken ship which had mined tin in the sea. This ship was retired from its operations, because tin company was bankrupt since 1991. Our visitors were sad when I told twenty thousand people was loss their jobs in 1992. So, it is too difficult for our family in Belitung to change their profession to anothers. But suddently my visitors smiled again when I told there was no maintenance again to the area near the ship in Tanjungpendam beach, except for dating. Another effort to find Mrs. Ellen �s place of birth was hospital �Kasih Ibu� in Tanjungpendam area too. His husband asked me to look for old archives about his wife birth there. �Oh my God, I�m not sure you can find it, sir,� I said to him in a whisper when we visit pregnance room. But, they were still happy because one of their questions about their originality was answered. Time to take pleasure was arose in the next minutes. We enjoy our travelled to Manggar city, to the Buddhist temple in Burung Mandi and off course to the beach. Mr. William got sea water to his body and enjoy the sun beam on the beach while his wife sit in coconut chairs not so far from him. I and Mr.Syam as driver were be guests for them when we took lunch at Cafe Tega, in Manggar city. I had friends too in this cafe, Mr.Pani and Mrs.Rini as manager of this natural restaurant near beautiful lake. We ate burn shrimp or almost look like lobster, Tenggiri burn fish, and many other seafoods. Our closing traveling in Manggar was Samak hill. The hill where Netherlanders building was located here. In the top of the hill we could see beautiful sight of the sea, Karimata strait or South China sea. If you sail to the east 200 km away you could reach Kalimantan or Borneo island. It was very cool on the top although in the mid afternoon. There is a fame school there, AC, as engineering school for tin mining. And off course there is a senior high school here where Andrea Hirata, the author of the best seller novel �Laskar Pelangi, Sang Pemimpi and Edensor� had studied. The dreamer or sang pemimpi event was took place here too. Maybe this will be one of the best place or route for Andrea�s fans. The last place we visit was Tanjung tinggi beach, one of the best beach in Belitung island or perhaps in Indonesia. Anothers beach that more beautiful than this are Tanjung Kelayang beach, Lengkuas island beach and Burung island beach. I think these are the most beautiful beach in Indonesia more than Bali beach. I said this statement because visitors who has many experiences to visit many beautiful beach in the world but never landed in our Belitung beach are always amazed with this beautiful sight. Mr. William said to me that you should be proud with your island. But, we didn�t have much promotions in Indonesia, even in the world. This is tropical region, with little different of time for sun rise and sun set everyday in a year. Remember, our beach has white sand, soft and smoot sand like flour, calm sea, fresh and clean water, with sequence granit boulder in edge cape, bright and clear sky, fresh air for breathing, no shark, an exact place to swim, sail or diving. Snorkeling activity was the right choice too for you, if you want to see beautiful fish, coral and many beauty flora and fauna underwater or below sea surface.It is better than Bunaken territory in north Sulawesi. When we arrived in pondok indah hotel, we impress our travelling by fun celebrating. We drank fresh Coca cola, Sprite, Fanta and even wine. I said to Mr.William maybe this was your memorable experience once in your life time, sir��. Yeah, he smiled. 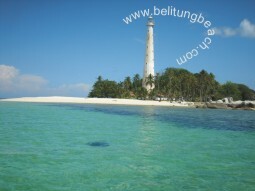 But remember, the main reason of their travelling in Belitung island was to answer where the place of birth was. In my sentence was where we are from�..? We always extend our knowledge to answer the question where we are from.The first effort was to know our genealogy. In Belitung people tradition, we always ask each other about our parentage. We called this tradition as BEGALOR. The second effort was to answer who was the first human being in the earth. Maybe this is difficult question to answer and still be a long debate until now for us. The third effort was to answer where was life came from. We had created simple basic form of life in laboratory that look like a similar condition with the early earth era. But, we still didn�t know exactly how solar system was formed after the big supernova in outer space and then protostar that was accompanied by protoplanet were created. If we extend our limit of sciences to the physics especially in cosmology, we had the question about the existence. Quantum fluctuation were assumed to become the first big bang for created of the universe. Although until now there is no complete theory of everything, but we grateful had two the best model to describe our universe those are general relativity theory from Einstein theory to describe macrocosmos (the vastness of the universe) and Quantum theory to describe microcosmos (particle of elementer, basic form of everything in the universe). Nowadays, when I wrote this article in Heru�s blog, more than 8 thousands phyiscist in LHC (Large Hadron Collider) in CERN, Geneva, Swiss (and border with France) was made experiment to test standard model. Who dare to change the paradigm, if we find a completeness in current theory. Or, will we change an answer about our origin�? My conclusion about � the question where we are from��?� are human being always have curiosity and especially they want to know more about their original. In small case with Mr.Willian and Mrs. Ellen, they just want to know a little question about their place of birth. In big case with us as human being, we want to know how the universe created and about its laws to present us here although it will spend more cost. Don�t you want to participate in answering where we are from�? I will wait your comments��..